I put in a lot of time in producing the photographs for the blog. After the model is ready, and I decide to produce it, I start thinking about a concept for the photography. The questions that arise are: what is the desirable atmosphere, what are the right colors and location to be used as a background for the outfits. I choose the proper styling and look for the accessories that will perfect the look. In the first few posts I used purses, shoes and jewelry from my own personal collection. After feeling that I have made the most of my collection, I contacted a few talented Israeli designers and we started cooperating. 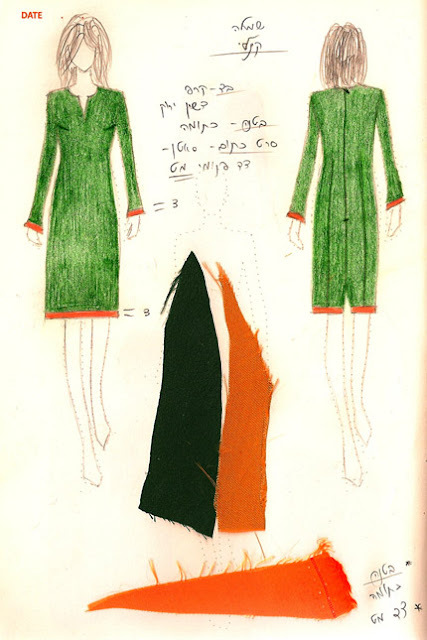 This Crepe De Chin long sleeved dress is very light and very fitting for the Israeli autumn and winter seasons. In the colder days you can simply add a jacket and you’re all set, you are both warm and have winning chic. The dress has a straight shape, gently touching the body, and a “V” neckline. The orange lining is sewed compatibly with the fabric stripes, and when the body is in motion you can see the lining peeking from the neckline for a careful and elegant look. The ‘Kinley’ dress is suitable for a day at work, but can also be worn as evening wear.